Update v2.1 – Custom grid, player promotions, and much more! Today marks the 3rd month that we’ve been out on Steam Early Access! It’s amazing how far we have come since April and it’s all because of you guys. Thank you for supporting and sticking with us. This update brings you a lot of requested features and fixes. There’s still a lot more to come, so stay tuned! 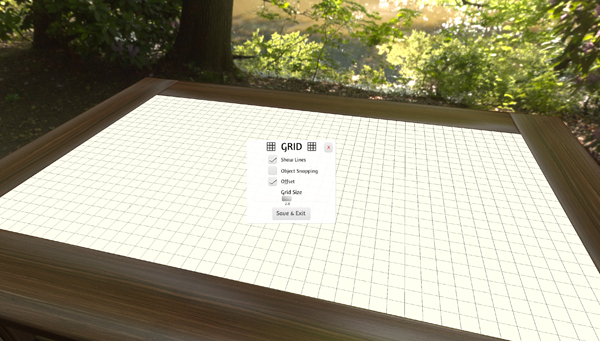 You can now enable visual grid lines. This is very useful for your RPGs. These grid lines can also be used to snap the location of objects for easier placement. The size of the grid can be adjusted to fit your games rules. Offset can be enabled so that the object snap location is in the middle of squares instead of the lines. As a host you can now promote a person so they have many admin powers like the host. Promoted player can change the game, spawn objects, and many other host abilities. Promoted player cannot save or load mods, may be possible in the future. Most of the built in games have an included rules for the game that can be read. You can also modify this for the rules of your modded game. Rules have a 6,000 character limit, so it is a great place to store information that can’t be on the notepad. 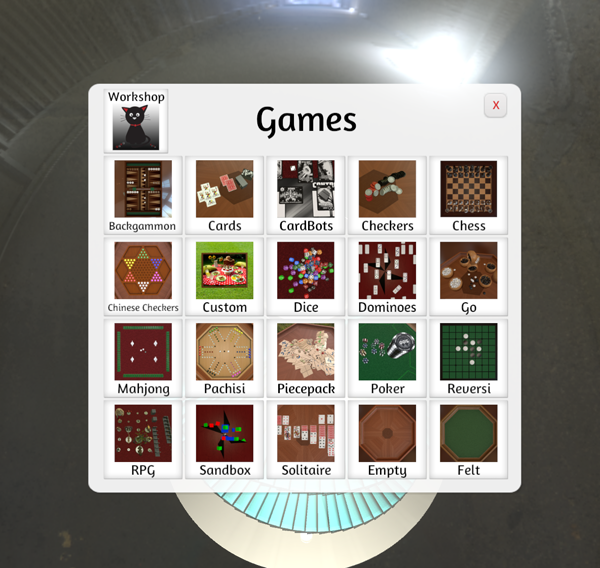 Games selection menu has been redesigned into the current minimal UI. Tweaked positions and anchors on different elements for a more consistent spacing along of the edges of the screen. Top bar will draw on top of everything else keeping it from being covered up. Spawning is now working properly for Hosts that are in spectator. Drag spawning now uses the position of the UI element instead of the hand. Spectator/Grey color selection is disabled when in hotseat mode. Escape Menu for clients no longer has workshop upload, save, and load. You can now change your color from the escape menu. Server name can now be seen in the escape menu. Close buttons have been added to all the windows that were missing them (Settings, Host Options, etc). Ping is now shown next to the players name, it’s color coded (Green <100, Orange <200, and red >200). Deck animation added for shuffling. Workshop now supports an infinite amount of subscribed mods, no longer capped at 50. Fixed issues with collision on certain custom objects not working properly on load. Direct connect is now working properly again, color selection issue and Improper info resolved. Custom Table texture will no longer mess up when rewinding. Fixed client custom textures and meshes accidentally being deleted, when a duplicate model is removed. Hidden custom cards in hand now properly load and are no longer white until removed. Fixed spectator/grey host end turn crash. UI code optimization for name plates. Name clipping on circular table reduced by shrinking names. Linux, opening Cards in Chest will no longer crash the game.